I started BeautyMama for two reasons: first, I wanted to create a place where mothers could get useful, honest beauty information that isn’t influenced by trends. The beauty industry has become so technical and moves so fast, I know it’s hard to keep up. When my most savvy friends asked me time and again for guidance, I knew I had to create a shortcut to the best in beauty, while making it all fun and relevant and, dare I say, empowering. Reason #2 is more personal: beauty is about so much more than makeup. it’s about moments: the hard ones, like when you have to explain to your preschooler why you put on makeup. The inexplicable ones, like getting a Brazilian bikini wax at 9 months pregnant. And the gentler ones, like when you see what you always thought was your worst feature on your daughter’s face and think it’s beautiful. 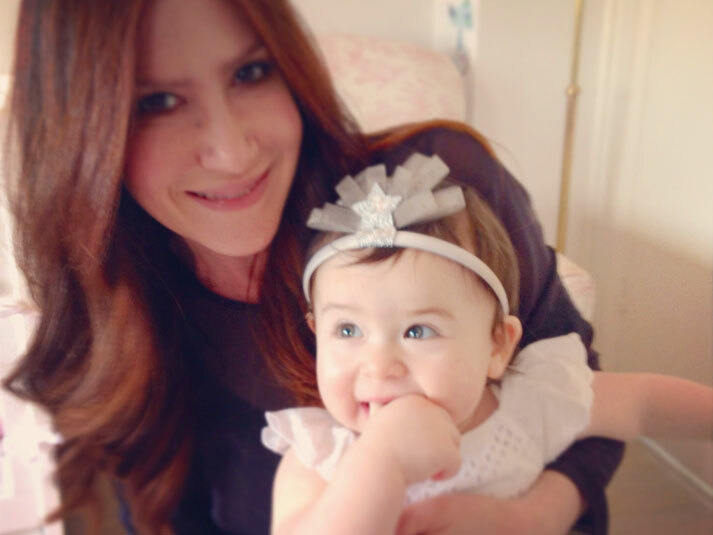 As a beauty editor and mom, I’m thrilled to share it all with you. Here’s to the moments—and maybe the makeup in your moments, too. I’m so glad you’re here. I’d love to hear from you. Email me at Michele@BeautyMama.net. I have two daughters, ages 7 and 1. My first born looks just like me. My baby is an exact replica of my husband. My ideas about beauty and self-esteem entered a new dimension when I became a mother to girls. I like my coffee and my martinis strong, but one and I’m done. I wear a smokey eye day and night. I never wear bold lipstick. I grew up in Miami and I never wore sunscreen. Since becoming a parent, I’m not much of a night person either. I read voraciously. But only fiction. I started wearing makeup in 7th grade. Lots of Cover Girl and Wet n’ Wild. I can throw and catch like a guy. I am also an excellent hula hooper. I know Every.Single.Word. to Rapper’s Delight. My first job was as a production assistant for a live political talk show in Washington, D.C. It was the first and last time I had anything to do with politics. I continued to work in the media for 10 years for all the big 3-letter networks as a writer and producer, mostly online. I wrote and starred in a very bad reality show for MTV that never aired. When I was little, people thought I looked a lot like Punky Brewster. Last year, someone actually asked if I was Soleil Moon Frye all grown up. Also, when I was a teenager, I was mistaken for the singer Tiffany All. The. Time. I have written about art, beauty and interviewed celebrities for magazines. The two most unforgettable: Donna Karan and Kelsey and Camille Grammer when they were still married and talking about the importance of Feng Shui. I have a wicked sweet tooth that causes me to do unspeakable things to pastries, chocolate truffles and ice cream with chunks in it. I am a proud alumni of The George Washington University, North Miami Beach Senior High School, Glades Junior High School, Kendale Elementary School and Pinewood Acres nursery school. Click here if you’d like to know more about my past incarnations as a writer-producer.